Land records are a resource that sometimes get overlooked by researchers. Land settlement in Ontario has a complex history that can sometimes be cumbersome to research. This blog post seeks to address the history and dispel the confusion surrounding this informative resource. Land records can fill in the blanks between census records and flesh out how your ancestors lived between birth, marriage, and death registrations. It is important to understand the history of the land you are researching so that you can put the information you find into its proper context. Land changes by geographical boundaries for administrative purposes over time. Thus, a piece of land may have been part of a different township, county, or district at different periods in time. As a result, you may have to look for land records in different administrative institutions. For example, concessions 1-4 of the former Sombra Township in Lambton County passed into the control of Gore Township in Kent County during the mid-19th century. Over time, the land which is now our community was in the District of Hesse, the Western District, and after redistricting finally became Lambton County. Knowing at which point in time and which administrative institution will allow you to be a more effective researcher into land records. See the Archives of Ontario webpage on Early Districts and Counties for more information. 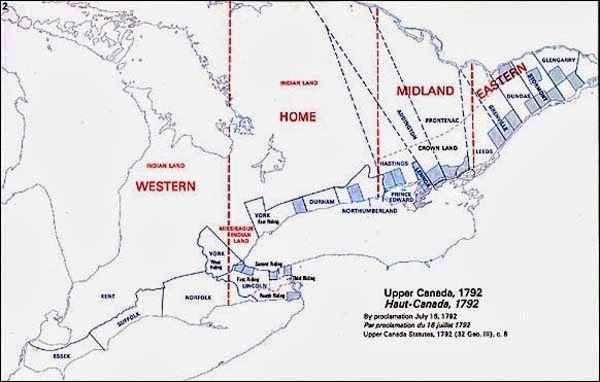 All land in Ontario was considered Crown Land (as in belonging to the government) from the time it had been surrendered to the Crown by a First Nation, up until ownership was transferred to the first private owner. The land was initially surveyed into townships consisting of concessions and lots. 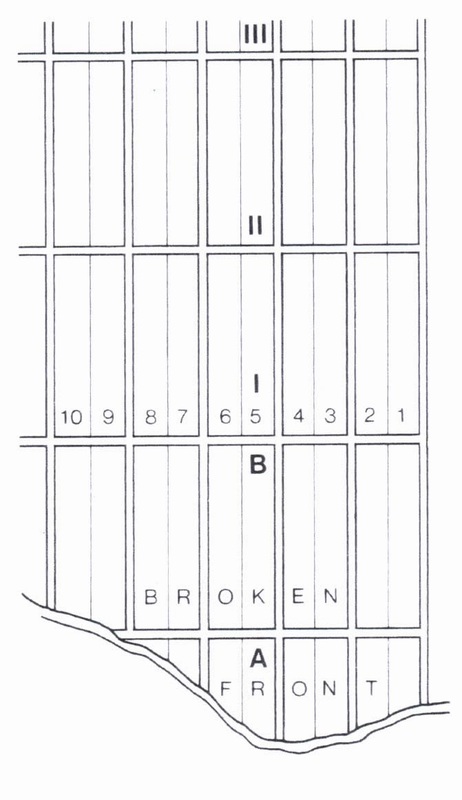 Concessions were strips of land about 1 1/4 mile wide and are often separated by road allowances of 66 feet wide. 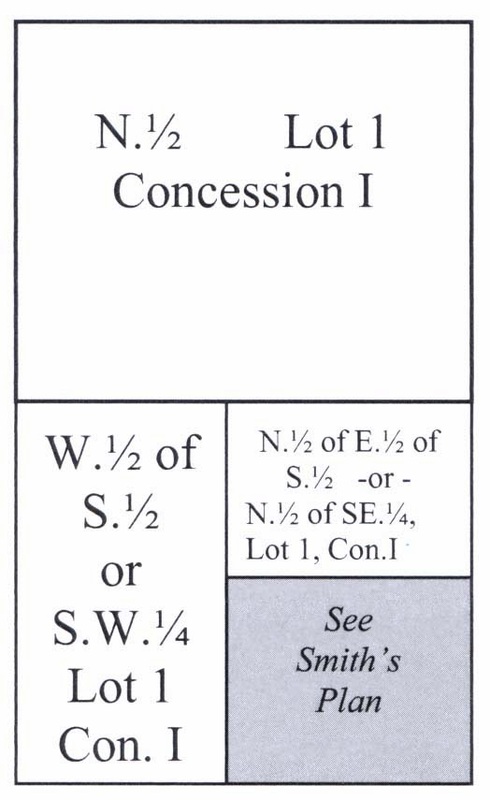 Concessions were then divided into lots, which were typically 200 acres, and individuals seeking land had to apply to the Crown to be granted one of these lots. The Upper Canada Land Board (1765-1804) database from Library and Archives Canada is an online index to individuals mentioned in the Land Board records. Most records are between 1789-1794 (when Land Boards existed to facilitate settlement in the districts) and contain many references to Loyalists in the minutes, reports, and correspondence. This index points you to a microfilm reel containing the full document which can be ordered through the Lambton County Archives and consulted in our facility. 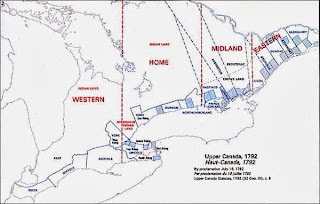 The Upper Canada Land Petitions (1763-1865) is an online index from Library and Archives Canada of the petitions to obtain land in Upper Canada. Petitions are very useful since the applicant was required to prove their identity and may contain items such as letters of support from a magistrate or commanding officer. The petitioner was also required to explain why they deserved a grant and may contain the individual's life story or service in the American Revolutionary War or the War of 1812. This index points you to a microfilm reel which can be ordered through the Lambton County Archives or your local library. Also, the reels have been digitized and the records are available online. Note the microfilm number from the online index and consult the pdf of the digitized record. A note of caution however, the records are not searchable so you should consult the "Help" page to decipher how to navigate the records using the reference information from the index. The best resource for Crown land records is the Ontario Land Records Index (OLRI.) This resource, created by the Archives of Ontario, is an index of many records from various institutions involved in the granting process. It is only available on microfiche (at the Archives of Ontario, ordered through your local library, and at institutions who own a copy.) At the Lambton County Archives, we have a copy of the index, which has been indexed by surname and by township. Thus you can search it by ancestor or by land. Ontario Land Records Index for John Wetheral. After the land was surveyed and granted to the first private owner, subsequent transactions for a piece of property were registered through the local Land Registry Office. Thus land transfers between private individuals are registered at the local level. Although these transactions started in Ontario in 1793, it is important to note that registration was not mandatory until 1846, so many transactions were not registered or were registered many years after the event had occurred. To research local land records, you will need to know the legal description of the property: the lot and concession numbers for a specific township. These records are available at the Land Registry Office (LRO) where the land was registered or at a local repository. 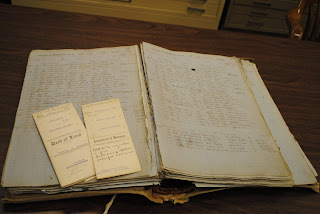 For instance, pre-1955 land registry records for Lambton County are at the Lambton County Archives. Once land registration was legislated in 1865 to local LRO, Abstract Indexes were created to record transactions registered to a certain lot. In these ledgers, separate pages were kept for each individual lot as it was patented by the Crown. So while these indexes contain information such as name of buyer/seller (grantee/grantor), type of transaction (bargain and sale, deed, will, etc. ), date, size of property, amount of money, and the corresponding instrument number, these indexes are for the entire lot. Many lots have been subdivided numerous times over the years into smaller parcels of land (i.e. north half of lot 1 concession 1, the southwest corner of lot 1 concession 1), but the transactions are all registered to lot 1 concession 1. This can make it difficult (but not impossible!) to see the ownership history of a particular property. After consulting the Abstract Index for the land you are researching, you need to note the instrument number in order to locate the corresponding Land Instrument. These are the original documents for the sale, deed, mortgage, will, etc. registered in the Abstract Index. It is important to note that many of these instruments have not survived, for example, pre-1846 transactions when land registration was not mandatory, or mortgages which were given to the owner when fully paid. However, many land instruments have been preserved and we have them for all townships in Lambton County. Land Abstract Index ledger and instruments at the Lambton County Archives. The above was merely an overview of the land records system in Ontario. There are many other online and in-person resources available at archives and libraries across the province. The information in this blog post is intended to aid you in your research by providing important information in land record research and by identifying key resources. Hopefully, land records are no longer an imposing obstacle to your family tree or local history research! As always, please contact us if you have any questions. We have many reference books in our collection which can further aid your research into land records in Ontario.